Elizabeth Mestnik Acting Studio’s New Website! We’re proud to announce the launch of Elizabeth Mestnik’s new website. 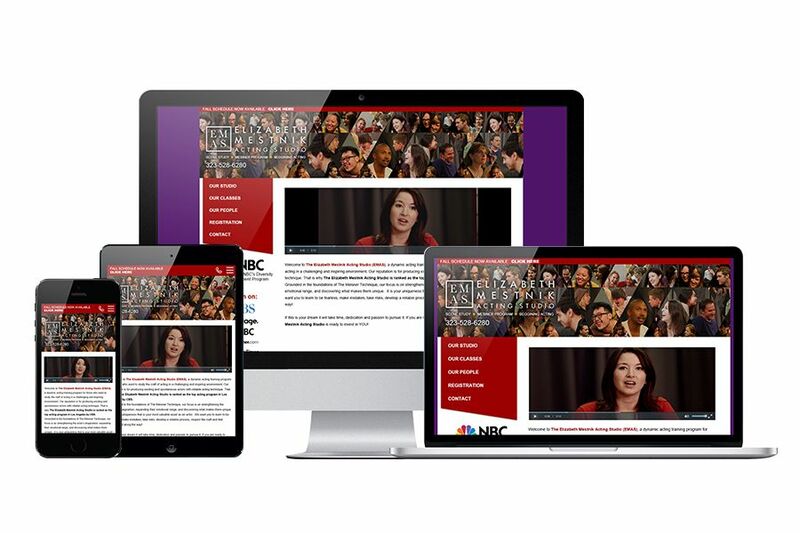 Designed to be responsive to mobile phones and tablets, the full range of content will now be available to users no matter what device they’re using. As LA’s premier Meisner-based acting school, we believe the site will not only provide a more user-friendly experience, but also better provide information, ideas, and news that’s relevant to the LA acting community. We’ve updated the site with a significant amount of new information regarding our studio itself. Anyone interested in acting, from beginners to experienced actors can see exactly what we offer. From pages that will provide more frequent updates on upcoming classes and events, to new pages that contain biographies of our teachers, coaches and alumni, our hope is that the new site allows the acting community to better understand who we are and more easily engage with us. Furthermore, we pride ourselves on bringing experience and a unique technique to our students. Emasla.com is not just a place where actors can sign up for classes, but rather a place where anyone can come to better understand our methods and technique specifically, and the acting industry more generally, in particular how they relate to you as an actor; we’re happy to share our knowledge and experience on this new platform. We hope you like it! After conducting a poll of internet users asking them to answer the question, “Of all the actors who appeared in a feature film in 2014, who do you most respect or admire?” the most voted for actor was Bradley Cooper with 6.8%. Although not released in 2014, this is probably due in large part to his recent portrayal of Chris Kyle in American Sniper. With a few exceptions, such as Chris Pratt, Bradley Cooper, and perhaps Matthew McConaughey, it seems that most people’s opinions of their favorite actors are not decided by one year’s work. Outside of these two, the other actors making up the top eight were Denzel Washington, Morgan Freeman, Jennifer Lawrence, Angelina Jolie, and Leonardo DiCaprio. Although these actors did feature in 2014 films, one could argue that their prior work had a greater influence on opinions than their performances over the last year. When comparing male and female responses, the top two actors remain the same. However, across age groups, one begins to see a difference in the people’s preferences. The clearest trend here is Bradley Cooper getting the most votes among the three age groups between 25 and 64. People clearly feel strongly about American Sniper’s political implications which likely influenced peoples votes (not to discount Cooper’s performance). The preference for Chris Pratt among 25 to 34 year-olds illustrates that he has an ability to strike a chord with this generation’s sense of humor. George Clooney among 65 and up? He’s an excellent actor, but as to why this age group? … your guess is as good as ours. Lastly, a special thanks for the response “I don’t go to the movies.” … duly noted.